All my wigs are brand new and have Care Instructions printed on the tags. 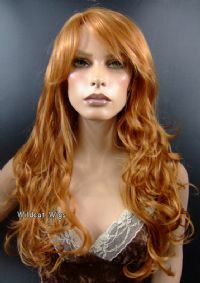 Gorgeous New TOP QUALITY Wig from the Natural Collection of Wig America. This is called Tonya. 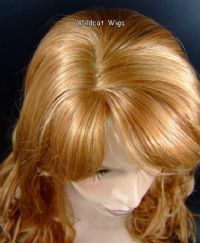 This gorgeous wig has an off-centered skin part and is very long and layered. About 30" long from top to tip. Check out the pictures. . .. This looks and feels like human hair, but is actually made of synthetic fiber ... very easy to care for! Why pay more for these quality wigs? I keep my profit way down, and pass the savings to you! Compare my prices and you will see. THIS IS AVAILABLE IN THE FOLLOWING COLORS .. PLEASE TELL ME YOUR COLOR CHOICE AT TIME OF PURCHASE AND ALLOW ABOUT 3 WEEKS FOR DELIVERY BECAUSE THIS WILL NEED TO BE ORDERED FROM MY SUPPLIER IN YOUR COLOR. Make a note in the messages section when you checkout. 1-black, 1B-off black, 2-darkest brown-almost black, 4-dark brown, 6-chestnut brown, 8-light chestnut brown, 10-medium golden brown, 12-light golden reddish brown, 14-light golden brown, 15-golden reddish blonde, 16-honey ash blonde, 19-light strawberry blonde, 22-champagne blonde, 24B-light butterscotch, 24B/22- light butterscotch and champagne blonde frost, 25-golden blonde, 26-medium golden blonde, 27-strawberry blonde, 27A-light light auburn, 27C-light ginger as pictured, 30-medium auburn, 33-dark auburn, 130-fox red, 18/22-light ash brown and champagne blonde frost, 24/14-light golden blonde and light golden brown frost, 27C/29-light ginger and cinnamon, 33/130-dark auburn and fox red frost, 8T124-light chestnut brown mixed and tipped with light golden blonde .. SORRY .. 24B/613 is once again on backorder from my supplier. They refuse to order enough of these! Please let me know if you have a second color choice .. many of these sell out very quickly and may not be available.